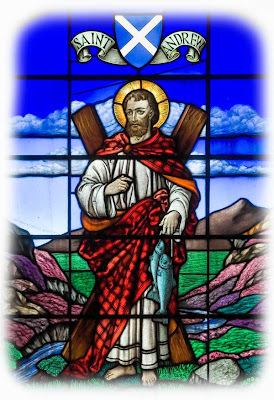 Saint Andrew is the patron saint of Scotland, Greece and Russia and was Christ's first disciple. About the middle of the 10th century, Andrew became the patron saint of Scotland. There are around 600 pre-Reformation churches in England named after Saint Andrew, in contrast to Scotland's handful of churches of all denominations named after the Saint. Nevertheless, it was Scotland that adopted Andrew as its patron, which must have given them considerable political leverage with the Pope in pleading for help against the English. This was done in 1320 (The Declaration of Arbroath) for protection against the attempts of English kings to conquer the Scots. The 1320 Declaration of Arbroath cites Scotland's conversion to Christianity by Andrew, "the first to be an Apostle". Traditionally, Scots also claimed that they were descended from the Scythians, who lived on the shores of the Black Sea in what is now Romania and Bulgaria, who were converted by Saint Andrew. According to Tradition, Andrew left the Holy Land after Pentecost to spread the Gospel in Greece and Asia Minor. In 60 AD, during the reign of Nero, he was working in Patras, where he baptized the wife and brother of the Governor, Aegeus. The Governor was so incensed by this, he ordered the death of the Apostle. Andrew was crucified on a cross in the shape of an X on November 30th. How did the relics of Saint Andrew come to Scotland? There are two versions - the first appears to be a pious legend. In this, Saint Regulus (later known as Rule), a Greek monk and keeper of St. Andrew's relics at Patras, was told in a vision to hide some of the relics until further instruction. A few days later, the Emperor Constantine transferred the remaining parts of Andrew's body to Constantinople. An angel again appeared and told Rule to take the bones he had hidden and go west by ship. Wherever they were shipwrecked he should lay the foundations of a church. The angel foretold how pilgrims would travel to this shrine from all parts of the West to receive health of body and soul. Saint Rule's ship was driven ashore by a storm onto the headland of Muckross in Fife, into the little village of Kilrymont (later St. Andrews). Halfway between the Castle and the harbor is said to be Saint Rule's cell. 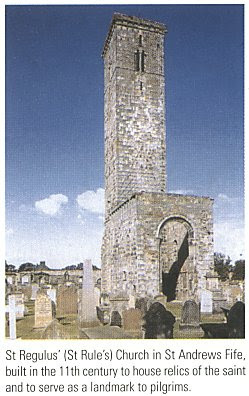 A second (and probably more reliable) explanation says that the bones were brought to St. Andrews about 732 AD by Acca, Bishop of Hexham (near Newcastle), a well known venerator of Saint Andrew. Around the year 832 AD (although some say 735 AD) the Northumbrian King Athelstane is said to have camped at what is now Athelstaneford in East Lothian, before his battle with the Picts under King Angus mac Fergus. Saint Andrew appeared to Angus in a dream and promised victory. During the battle, a saltire cross was seen in the sky, putting heart into the Scots. Athelstane was killed at the ford over the Cogtail burn. In gratitude, Angus gave gifts to the Church of Saint Regulus at St. Andrews. He then ordered the Cross of Saint Andrew to be the badge of the Picts. However, this foundation story of a more stable kingdom in what would become Scotland is almost certainly modeled on the Roman Emperor Constantine the Great's victory at the Milvian Bridge, Rome in 312 AD at the banks of the River Tiber when he became convinced of the power of Christianity by seeing the symbol of Christ (the Chi Rho - the Greek letters Χ Ρ, the first letters of 'Christ') in the sky. Whatever route the bones of Saint Andrew may have taken, we do know that in AD 908, the only bishopric in Scotland was transferred from Abernethy (the royal residence) to St. Andrews. Subsequently, the town rapidly became famous as a pilgrimage site. During the reign of Malcolm Canmore and Queen Margaret, devotion to Saint Andrew became nationwide and Andrewmas was made a national festival. Scottish soldiers fighting in the Crusades honoured Saint Andrew as Patron of Christian Knighthood. In 1318 St. Andrew's Cathedral was dedicated and became known as the Canterbury of the North. It was the largest church in Scotland before the Reformation. In 1411 Saint Andrew's University was founded and sixty-one years later, the See of St. Andrews was raised to Metropolitan status. At the Reformation, the great Morbrac (reliquary) which carried the bones of the saint and weighed one third of a ton, was destroyed. 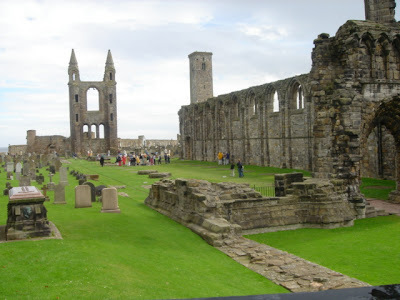 On 14th June 1559 the interior of St. Andrews Cathedral, including the shrine and relics, was destroyed by reformers who had accompanied John Knox to the city. The street games, the festivities, the fireworks and the processions with evergreens, which used to take place on November 30th, were banished for ever. The three centuries that followed were difficult for Catholicism in Scotland. Catholic worship was outlawed. The traditions were kept alive in a few outlying glens and islands. Catholics in cities and towns had to rely on visiting priests, trained overseas. Priests like the Jesuit martyr John Ogilvie operated underground and were put to death if discovered. What, in practice, did Saint Andrew mean to the Scots? When, in 1603, the new King James I and VI tried to make one united flag, the Scots resisted because the saltire cross had been given an inferior position in the design. Scottish ships at sea persisted in flying the Saint Andrew's Cross. The Union Jack was the official flag from the Union of the Parliaments in 1707. But, while the red Lion Rampant is the proper Royal flag for Scotland and the Thistle the national badge, official heraldic decrees state that the national flag and arms of Scotland are the Saint Andrew's Cross. Saint Andrew is patron of Russia and Greece but has special significance for the Scots. The Declaration of Arbroath (1320), written by Scottish clergymen to Pope John XXII, was an appeal to the Pope against the English claim that Scotland fell within the jurisdiction of the Archbishop of York. The Declaration argues that the Scots were a distinct people who had long enjoyed the protection of Saint Andrew, brother of Saint Peter. 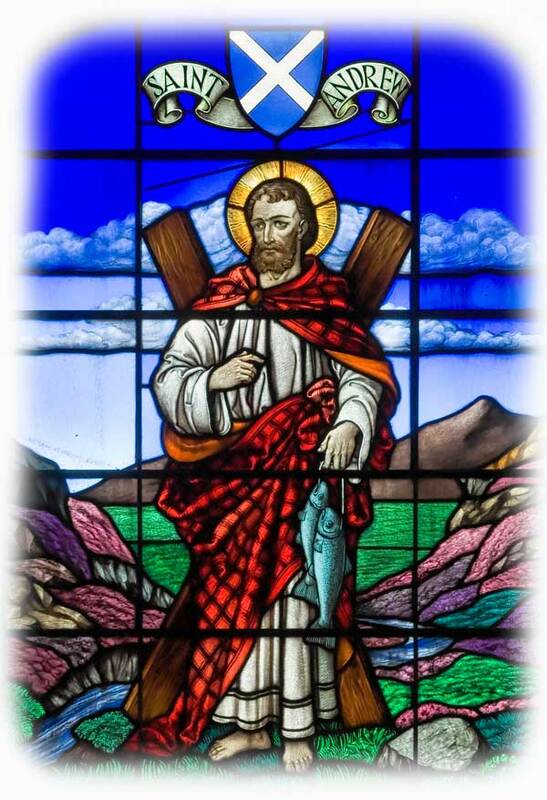 Saint Andrew is described in the Declaration of Arbroath as "our patron or protector". At the Battle of Bannockburn, near Stirling in 1314, the Scottish soldiers had worn the white cross of St. Andrew on their tunics and before the battle began they knelt in prayer, invoking his protection. Four years later Robert the Bruce, at the dedication of St. Andrews Cathedral on 5 July 1318, placed a parchment at the High Altar expressing the nation's thanks to the Saint. William Wallace's battle-cry was "St. Andrew mot us speed" (May Saint Andrew support us). Prior to the disastrous Scottish defeat at the Battle of Flodden in 1513, a great many Saint Andrew's crosses were made at the Boroughmuir in Edinburgh. 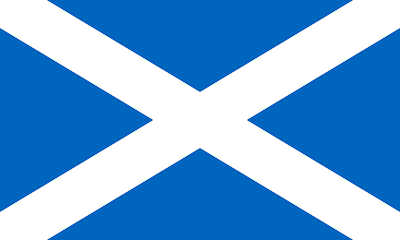 The Blue Blanket flag gifted to the Trade Guilds of Edinburgh also bore the Saint Andrew's Cross, while Scotland's largest ship, the Great Michael, was full of Saint Andrew's Crosses, as were the Honours of Scotland. Mary, Queen of Scots' forces carried the saltire at the battle of Carberry; many Jacobite flags in the '45 Uprising also displayed the saltire. It soon became incorporated into the official badges of Scottish regiments. There was even a Saint Andrew coin issued by Robert II and a bawbee Scots halfpenny marked with the same cross. In modern times, the bones of Saint Andrew once more returned to Scotland. On the restoration of the hierarchy in Scotland in 1878, St. Andrews and Edinburgh was made the Metropolitan See of Scotland. In 1879 the Archbishop of Amalfi in Italy (where the bones had been brought in 1453 after the fall of Constantinople) sent to Edinburgh what was believed to be the shoulder-blade of St Andrew. Since 1846 the relics in Amalfi Cathedral have produced a mysterious and miraculous oil, called manna, every year on days specifically associated with the Saint – January 28th and November 30th. At St Peter's, Rome in April 1969, Pope Paul VI gave another relic - part of the skull of the saint - to Cardinal Gordon Gray, at that time Archbishop of St Andrews and Edinburgh. "Peter greets his brother Andrew," were the words of the Pope to the Archbishop. The relics of the Apostle are today displayed at St Andrew's altar in the Metropolitan Cathedral of St. Mary in Edinburgh. At St. Andrew's Cathedral by the shore at Patras, Greece other parts of the skull of Saint Andrew are cherished in a place of honor. A local superstition uses the cross of Saint Andrew as a hex sign on the fireplaces in northern England and Scotland to prevent witches from flying down the chimney and entering the house to do mischief. 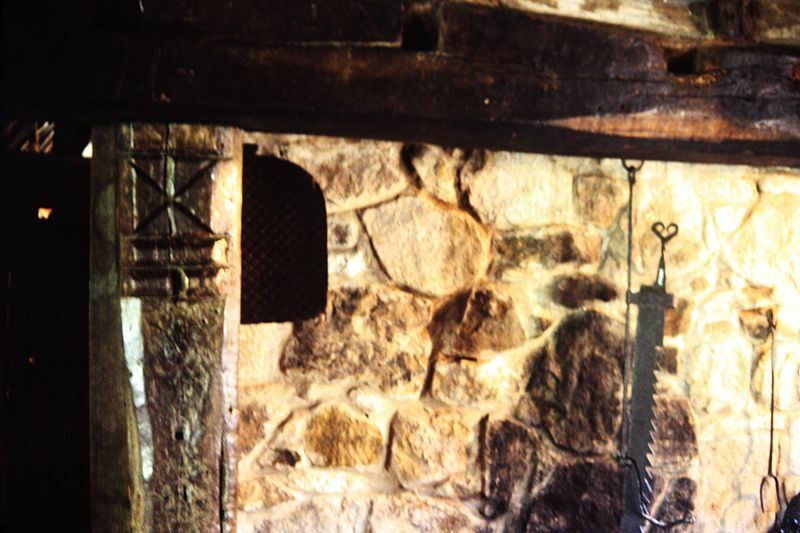 By placing the St. Andrew's cross on one of the fireplace posts or lintels, witches are prevented from entering through this opening. In this case, it is similar to the use of a witch ball, although the cross will activily prevent witches from entering, and the witch ball will passively delay or entice the witch, and perhaps entrap it.